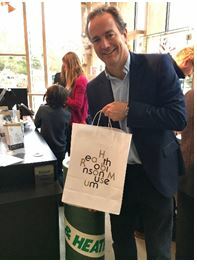 On Friday 28th October Nick Hurd , MP for Ruislip, Northwood and Pinner and Minister of State at the Department for Business, Energy and Industrial Strategy, paid a flying visit to the new Heath Robinson Museum in Pinner Memorial Park. Nick is a patron of the Museum and from the start has shown a great deal of interest in its development. 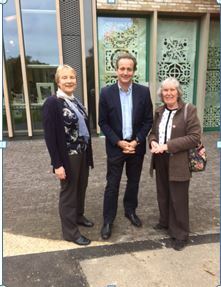 The Museum having opened on 15th October, he was shown around the Museum by trustees Cynthia Wells, acting Chair of the West House and Heath Robinson Museum trust and Veronica Chamberlain, Marketing Manager. Veronica, Nick and Cynthia outside the Museum with Diwali pictures in the background. The site itself pleased him “You cannot think of a nicer site, and it blends in so well”. “What a proud moment this is. Congratulations to all. Amazing”. Nick showed particular interest in the Activity Room, still decorated with the Diwali artwork completed at the workshop the previous week and where the Heath Robinson style “contraption” engineered by girls from St. Helens School, Northwood is still displayed. “After all this time, how extraordinary it is to have brought all this together in one place, it’s been quite a journey”. “It’s an intelligent shop delivering interesting and attractive things”. 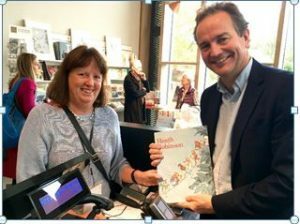 In all, it was a good visit, the Museum volunteers were proud to be able to show our local MP who has been so supportive around the Museum and to share the excitement with him. Nick Hurd on the left holding the Heath Robinson book he bought, with Margaret Seaman, Front of House Coordinator.